Ni Gallant: "Don't Leave Me Out"
So after the amazing #subtitlesnow campaign that Sasha wrote about CCAC have organised another cross-atlantic campaign to increase awareness about the necessity for subtitled online videos! This campaign entitled "Dont Leave Me Out" includes a video made by a number of adults and a couple of young people explaining why subtitles or "captions" are important to them in their everyday lives. Below is the press release CCAC have released along with some photos and the video! 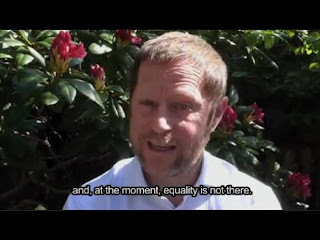 The Collaborative for Communication Access via Captioning (CCAC) is happy to announce the release of its first film to raise awareness and advocate for inclusion of quality captioning (subtitles) universally, for so many everyday needs. Created by the CCAC, all volunteers, with the assistance of professional editing, the CCAC invites all to participate in the new international media campaign, ensure that the video, freely distributed, goes viral globally, and welcomes requests for media coverage (e.g. news interviews, television, radio). The video is now live on the CCAC website, from today forward. Call it a film, documentary, or PSA (public service announcement) – when you see it, you’ll understand why mega-millions of citizens need much more inclusion of subtitles, captioning, and real time captioning in real life. Thanks to the sponsors listed in the credits, the CCAC is able to distribute the film without cost. Donations to the CCAC organization for continuing advocacy are welcome. The video, “Don’t Leave Me Out!” is a powerful educational message for audiences everywhere, and will be useful for a large variety of organizations, groups, and companies focused on access, disability, deafness, hearing loss, literacy, technology, and inclusion. Thanks so much! We welcome more members, free, with the submission of the short form on our website. Numbers count.